Some Indiana State University students combined magic and science to educate second graders at Dixie Bee Elementary School on the workings of the human body. Eleven undergraduate athletic training students put on the event as part of the American Physiological Society's "PhUn Week," an acronym for "physiological understanding." "We basically just demonstrated different ways that systems in your body work and we put it in terms that elementary kids could understand," said Emily Barnett, a sophomore from Aurora, Ind. Under the supervision of Alvaro Gurovich, assistant professor of applied medicine and rehabilitation, the students split themselves into groups of two to three to create presentations about the cardiovascular, respiratory, renal and neurological systems. "My students invested at least three hours per week for six weeks to put everything together," said Gurovich. Aside from weekly meetings with their professor, the students researched and developed a basic outline for what they would present to the second graders. "You don't want to just go into Google and pick Wikipedia or anything because anyone can get on the Internet and just post anything that they want. So you want to make sure that you have it from a scholarly author and editor," said Abby Anderson, a sophomore from Evansville. Part of the challenge for the college students was finding ways to make the material engaging for younger students, while at the same time educating them. "I know that we had a lot of conversations just trying to figure out how are we going to make this presentable so that they will understand it, but that we are still getting our point across because there is a lot that has to do with the body that is very challenging if you're not in high school or college," said Barnett. The Indiana State students decided to stage a magic show in order to help draw the attention of the second graders. "I wanted to get to the kids via magic -- via that ‘wow'," said Gurovich. "It helps the kids get involved earlier because, with me, I didn't learn anything about the human body until junior high -- seventh or eighth grade. 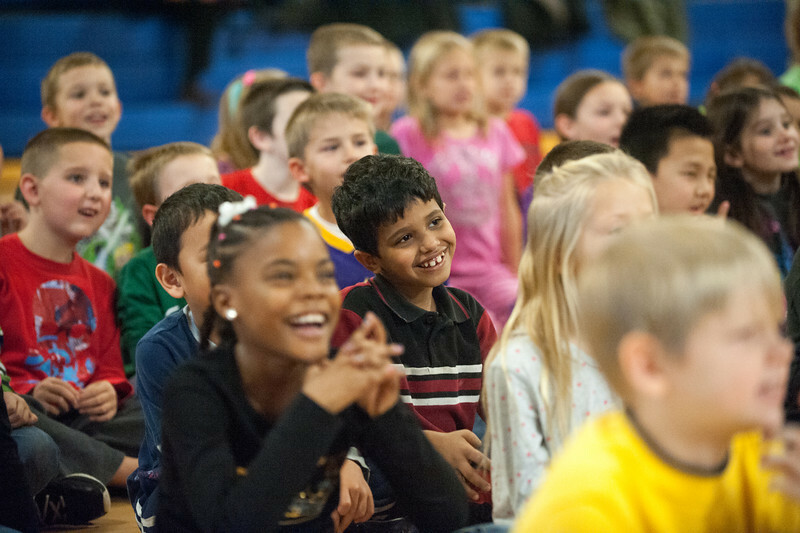 With second graders its not a whole lot, but they can get a sense of what's going on in their body and how everything works and what regulates what," said Patrick Doyle, a sophomore from Peoria, Ill. The college students found their method improved the second graders' understanding of the material and also their engagement with it. But the Dixie Bee students were not alone in benefiting from the experience. "For us as college students, it helps get us out of the setting of the classroom and actually work with other people. For us its more of a learning experience I think just because we've never done anything like this before," said Anderson. The students plan to follow up on their work by attending the society's upcoming PhUn Week conference in Boston, Mass. They hope to present on their experiences with the second graders at Dixie Bee. In the future, Gurovich would like to work with his undergraduate students to expand the program to more local schools. 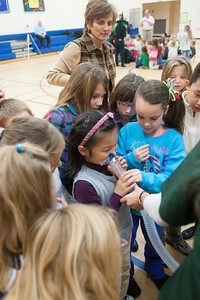 Some ISU students combined magic and science to educate second graders on the workings of the human body.